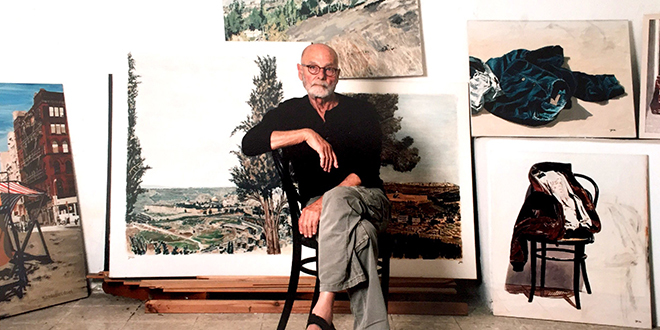 The Jewish Federation of Cleveland announces the opening of “Perspectives in Opposition: Horizons and Quartets,” an exhibit featuring the world of famed Israeli painter, Arie Azene. All are invited to meet the artist at an Open House on Sunday, February 26 from 1 – 4 pm in the Roe Green Gallery at the Jewish Federation of Cleveland’s Jack, Joseph and Morton Mandel Building, 25701 Science Park Drive in Beachwood. Artist talks will be at 1:30 pm and 3 pm. Arie Azene was born in Germany in 1934 and grew up in the Tel-Aviv neighborhood of Neve Tzedek. He lived on Kibbutz Zov for 28 years and currently lives and works in Jerusalem. He has had many one man shows since 1960 – in Israel, USA, and world-wide including group shows (Paris Biennale). His works are in many museums as well as private collections. Azene’s Cleveland exhibit will highlight two different collections of works. Skyline & Coastline, created from 2000-2011, explores the virtual line between two elements of opposed nature – as between the real and the abstract. In “Quartets” Chamber Paintings, his most recent work from 2013, Azene adapts the rules of chamber music into visual art. Registration is not required. Walk-ins are welcome. For more information on this exhibit or the Cleveland Israel Arts Connection, please visit www.jewishcleveland.org. This exhibition is presented by the Cleveland Israel Arts Connection, a program of the Jewish Federation of Cleveland. It is sponsored with support from Cuyahoga Arts & Culture.